How cool would it be to write a book for young readers, and then to have those kids be inspired enough by your work to write you about it? I think that would be pretty cool. 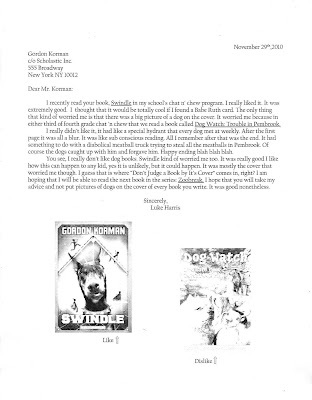 Here is a letter Luke wrote to Gordon Korman, author of Swindle, for his school book report. Fun stuff... Uncle Chuck, I think you'll like this. Click the image to enlarge. I should also mention that Luke's rock collection was deemed good enough to be featured in the Smithsonian Naturalist Center in Leesburg! Photos coming soon. It sounds like Uncle Chuck could have written that at the same age! 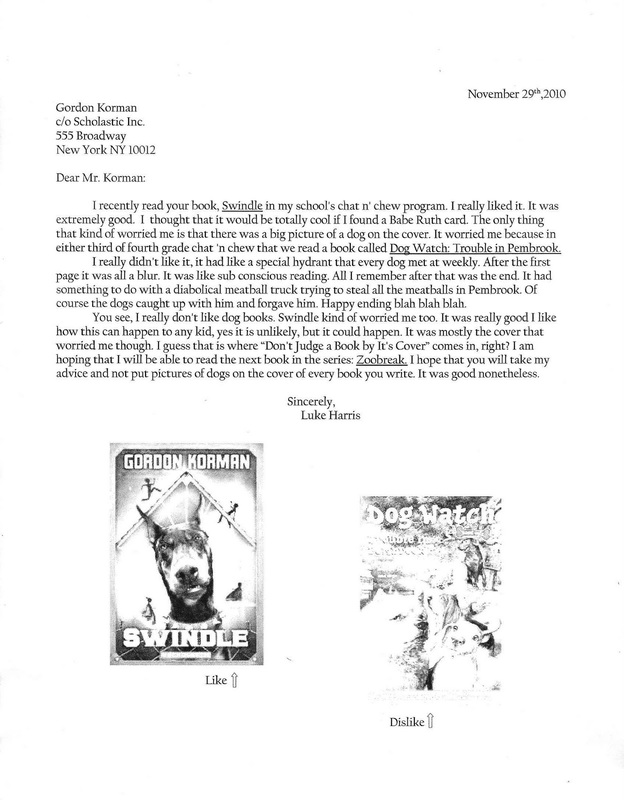 Hey Luke, that's a great letter. I don't think I would have had the fortitude to tell the author what to do with his book cover, although many times I've wanted to. So here's something interesting I recently learned: authors rarely get to choose the covers for their books (sometimes they don't even get to choose the title). Seriously. An author I really like wrote an article about this because he got so much static about his book covers. Remind me to never send Luke a birthday card with a dog on it! He might not even open it up to find the $1,000,000 check inside.